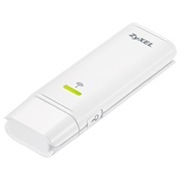 The ZyXEL NWD271N USB adapter brings you a better internet experience than the existing 11g network. With the receive data rates up to 300Mbps, you can enjoy the incredible high-speed connection no matter at home or office. Not only provide you speed and coverage advantages, it also works with your existing 802.11b and 802.11g network.